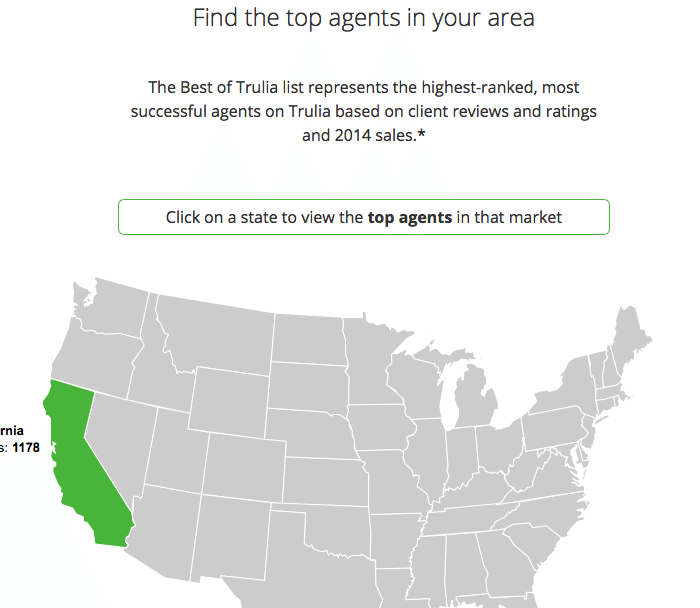 Trulia is publicizing the “highest-ranked, most successful agents” on the popular search site. The rankings, which are promoted on Trulia’s home page, are based on the client reviews, client ratings and the number of transactions completed in 2014 that have been added to real estate agents’ profiles. Less than 2 percent of agents represented on Trulia — several thousand agents — won spots in the “Best of Trulia” rankings, said Trulia spokesman Matt Flegal. The number of agents highlighted in each state varies considerably. In more sparsely populated regions of the country, states like North Dakota and Wyoming feature only half a dozen or so agents. But there’s more competition for the spotlight in states like California — where Trulia has identified 1,178 “top agents” — and Illinois (430), Florida (762) and New York (389). To have a shot at making the rankings, real estate agents need to have received reviews and ratings on their Trulia profiles and uploaded their completed transactions. Trulia does not automatically add completed transactions onto agents profiles, unlike some online agent matching or ranking services, Flegal said. Real estate agents must choose to disclose that information themselves, Flegal said, either by manually uploading the information or sending Trulia a document in CSV format that lists their past sales. “Agents can add sales from their entire career to showcase the entire breadth of their experience – both recent and overall,” he said. The new feature represents yet another twist in attempts by real estate search portals to help consumers research real estate agents before hiring one. Zillow has offered unfiltered reviews and agent ratings since 2010. Trulia and realtor.com had been sticking to recommendations, but last summer Trulia revamped its profile pages to include reviews and ratings. Some attempts to shed light on agent performance have drawn the ire of the real state community — particularly those that let consumers filter search results to identify top-performing agents based on transaction data sourced through multiple listing services or listing syndicators. All three of the top national search portals are capable of displaying agent transaction history information. But it was the ability to filter search results by transaction data, such as the number of active listings represented by an agent, that drew the ire of some real estate pros when realtor.com piloted an agent matching site, AgentMatch, in two markets in 2013. Last month data aggregator FindTheBest launched FindTheHome, a new real estate search site that allows consumers to dig up performance statistics on more than 300,000 real estate agents and sort agent search results by number of current listings. The performance data, acquired mostly from FindTheHome’s primary source of listings, ListHub, include an agent’s total number of active listings, the locations of those listings, their median price, and an agent’s total number of historical listings.